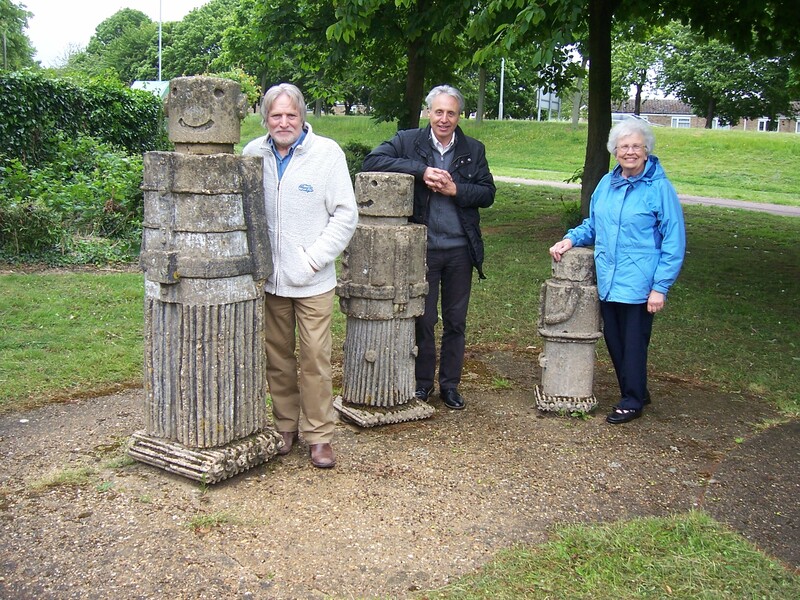 The Town Artist for Stevenage Development Corporation in the 1970s, Simon Axford Jones, returned to Stevenage in June 2015 to look at the play sculptures he had created. He is pictured by the popular “Robot Family” together with his former colleague Andy Hills (centre), who invited him to come back, and the Chairman of The Stevenage Society for Local History, Pauline Maryan, who had been researching local sculpture and sculptors. It is hoped to be able to repaint this and some of the other quirky sculptures in the Symonds Green area, as part of a community project. This page was added on 13/06/2015. First stage of repainting done. Symonds Green Scouts have learnt the robots will be ready for painting in August.